This stately bronze bust of Donald Trump is an heirloom quality collector's item celebrating the momentous presidency of this legendary man. With a background in business, real estate, and a special affinity for golf, Mr. Trump announced his candidacy for President of the United States on June 16, 2015, and took office as the 45th President on January 20, 2017. He turned his business over to be managed by his two eldest sons turning his focus on Washington DC. In his first year in office, President Trump has made many significant changes to policy and appointed Neil Gorsuch to the Supreme Court. This bust measures 3.25 inches wide, 2.75 inches deep, and is 5.5 inches tall; it weighs one ounce over a pound. 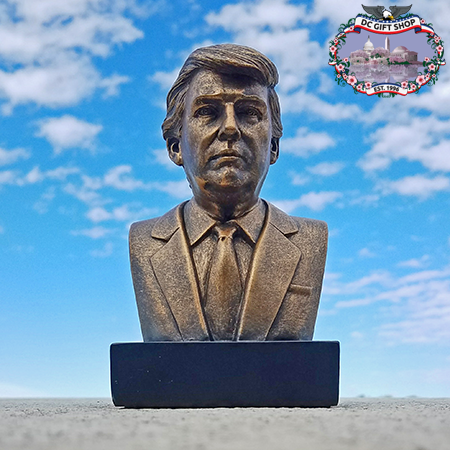 Bring the larger-than-life presence of President Trump to your home or office or give as a gift this holiday season!